There aren’t many businesses in general, much less golf magazines that have been around for 100 years and the only golf magazine with that kind of age is Golf Illustrated which first published in 1914, 98 years ago. Nationally re-launched – some might say reborn – this spring, it is the oldest golf publication in North America. Add that now, when the print publication business is anything but healthy, it’s a big bet for publisher Robert Rinner. Working out of their Tulsa, Okla. headquarters Rinner’s Fore Today Publications plans to publish four times per year and in addition to subscriptions, sell the magazine at newsstands, bookstores and specialty retail stores. Acknowledging the state of the economy and golf industry demand companies to look carefully at the expenditure of every dollar, Rinner told advertisers in the publisher’s column of the premier issue: To assist in ensuring we meet your targeted end-to-end solutions, we will be utilizing and offering flexibility with not only the print and online editions of Golf Illustrated but also digital video and mobile device applications. A prominent member of the team is Tulsa resident and former PGA Tour player Ron Streck. Fans will remember him as the first player to use metalwoods on Tour and at the 1981 Houston Open he was the first to win using them. Streck also has the distinction of being the first to win on the three principle men’s tours; the PGA Tour, the Nationwide Tour and Champions Tour. So Golf Illustrated has the pedigree and personnel to be successful. 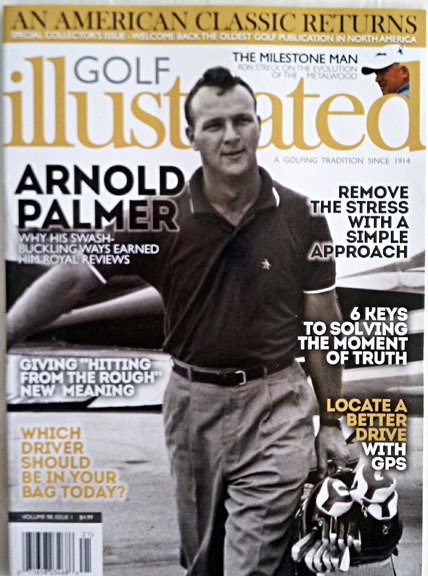 They even have The King, Arnold Palmer himself, gracing the cover of the premier issue. FULL DISCLOSURE: Golf Illustrated’s Equipment Editor is Ed Travis. 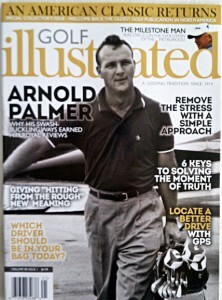 And if I may be allowed a bit of self-promotion, I did the cover piece on Palmer!